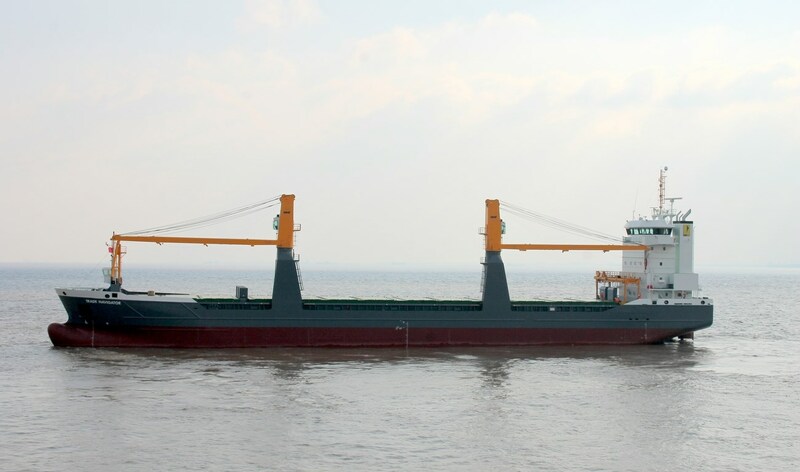 Home › Combi Freighter › Combi Freighter 8200 › Combi Freighter 8200 "Trade Navigator"
The geared multi-purpose vessel ‘Trade Navigator’ has been handed over to her owners FWN Trade BV in December 2013. Built in our sister yard Damen Yichang Shipyard, the vessel was handed over after a commission and a successful trial in Shanghai region. The vessel is the 4th of a series of 8200 tons MPP vessels of which 3 were delivered to Forest Wave Navigation in Heerenveen. The vessel started her maiden voyage on a ‘cargo collecting’ trip in Japan, back to China, stopover in Indonesia and now on her way to European waters. Typical for multi purpose vessels is the multi port visits these types make to load and discharge partial cargoes efficiently.